We teach you successful reefkeeping thru teaching, fellowship, and learning from each other. The Earth's reef's are threatened by increased by global warming. We aim to protect the reef thru reefing and growing corals, but we cannot achieve our goals alone. 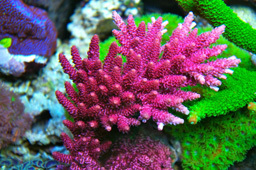 Find out how you can be a successful Reef hobbyist. Find out about our organization, mission, our methods, and the results of our decades of club history. Ready to take the next step? You can become a member our club, and start on your road to success. Welcome Coral Magazine as our newest sponsor. Subscribe here.